Happy Friday! Did anyone else think this week was just super weird? Not bad, just super weird. I’m so glad it’s over… I’m not sure if it is because it was directly following a holiday weekend, or what, but I’m happy to see it gone! John’s parents came into town last night, and we are excited to spend the weekend with them, so it should be a pretty fun few days ahead! Since there are less than 3 weeks until Christmas (what?! ), I figured I better get my Christmas bucket list up and running! Linking up with Christina, Darci, Natasha, and April for Five on Friday… Christmas bucket list style! Christmas movies, Christmas movies, Christmas movies… I’m talking about some serious indulgence here! Some of my favorites include It’s a Wonderful Life, Home Alone (1 and 2), Elf, Miracle on 34th Street, and The Holiday, …to name a few (but really, I’ll watch just about anything – including those terrible straight-to-television Hallmark movies – I don’t discriminate). Andddd I fully expect to be watching these movies while eating cookies (see bucket list item number 2) and drinking wine – ohhh, the holidays! What are your favorite holiday movies?! Holiday baking is always so much fun, but unfortunately, since we don’t have family to feed, I have no one to eat my goodies (except John and me… but really it’s just me because John doesn’t really enjoy sweets). So I plan to bring many goodies to work to avoid single-handedly eating everything! Here are some yummy baking ideas from Pinterest. And to me, even better than baking is a good ole Christmas DIY! I’m cheating a little bit on this bucket list item because I already have a Christmas DIY in the works, but I have many more on my list to tackle. How awesome (and easy) are these DIY ideas?! Pinterest for the win again! I absolutely love Christmas, and I absolutely love the advent leading up to Christmas. Every year, I always do several advent devotionals, and although I have read the Christmas story countless times, every time I read it again I am still in awe of God and His gift to us through His Son. The Bible app has several seasonal advent devotionals (some good, others super short), but I always enjoy doing several of them at a time… it’s a good reminder of the real reason for the season. I saw this idea on Annie’s blog and absolutely fell in love. Each year she binds all of the Christmas cards that she received into a book. Such a fun and festive way to remember everyone’s cards. I always feel so bad throwing old cards away once the season is over (which for me, is like February… just kidding, but no really, my Christmas cards stay on my refrigerator a while into the new year…) so this is a great way to preserve them. What's on your Christmas bucket list?! Looks like a fun Christmas bucket list! White Christmas is my all-time favorite Christmas movie so I definitely recommend it! The Family Stone is also a good one! I saw a recipe for peppermint macarons and thought of you! Yes, yes, yes White Christmas is worth seeing! It's totally nostalgic, fun, and the actors are extremely talented. Do see it! I just love this list!! I love Christmas movies so much too!! And yes, White Christmas is a classic! It's a special one for me because my Grandma loved it. You should definitely watch it and let us know what you think! :) and that card booklet is awesome. I need to check it out! Great bucket list!! I can't believe it's three weeks away - yikes! I also love any and all Christmas movies and have already watched several Hallmark and Lifetime holiday movies. No shame. I really like The Family Stone (even though I don't love SJP) it's definitely worth watching! I've seen White Christmas a bunch of times just because it's always on, but not sure it's worth it. Great singing in it though! Can't wait to see your DIYs! Have a great weekend! My favorite holiday movie is Love Actually, an absolute must every holiday season! And the baking and decorating, and crafts - looking forward to it all. Enjoy your weekend with your inlaws! I love everything about this post!!! I am all about those Christmas movies, there might definitely be a marathon this weekend. I also love those glitter branches - what a great idea! I'm all about the Christmas movies and baking too! I usually have to send things I bake to my husband's work because I'll just sit here and eat them all.. how can our hubby's not like sweets?! I've seen the Family Stone and its cheesy but I like it anyway since its festive! I want to bake alllll of those things this weekend- they all look so good! 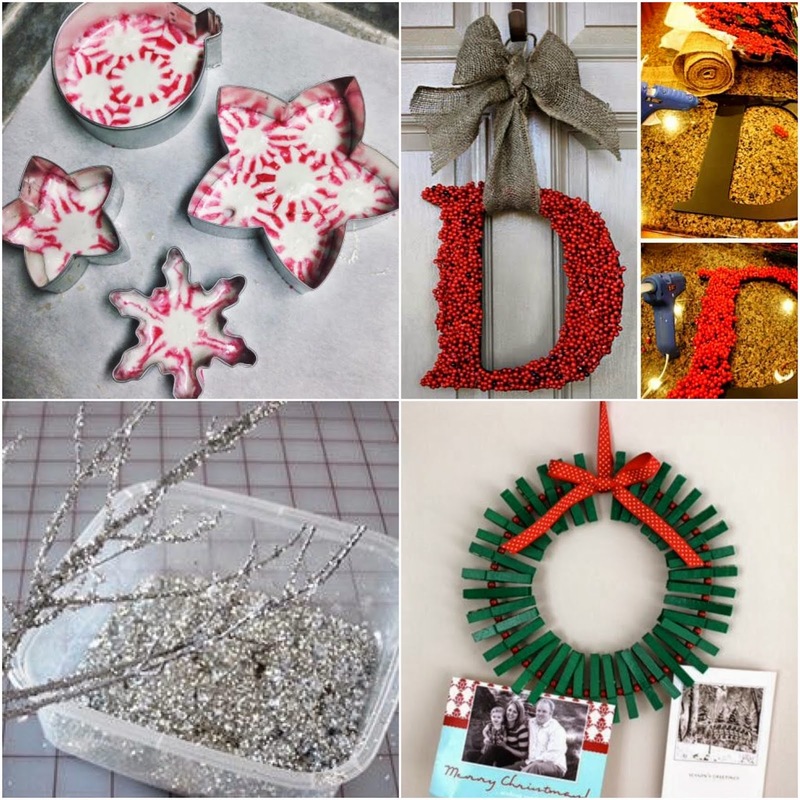 And I love the Christmas DIY's too! I'm glad this week is over as well, I'm hoping to do a little baking and decorating, so this post will come in handy :) A definite yes to White Christmas! Family Stone is a cute one too! 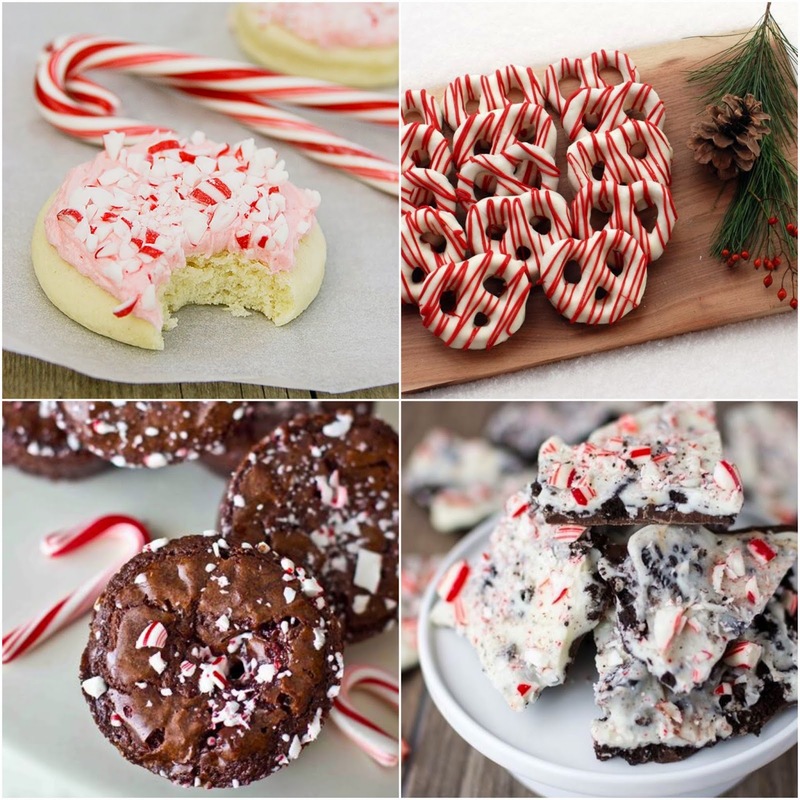 The Christmas treats look delicious and are an awesome addition to a holiday bucket list! White Christmas is fabulous! Great songs in it! And The Family Stone is really good too! Although, Christmas Vacation is probably my favorite! Such cute things! I love Christmas movies! Even though I usually tear up no matter what haha! You have to see White Christmas, even if it's only once! I've seen bits of Family Stone and it's ehh to me lol Enjoy having your in-laws there! The Christmas card book is a great idea! I need to get started on some Christmas DIYs myself! Love the glittered branches! THE HOLIDAY! I love this movie all year round but especially around this season of the year! Please post any and all recipes for desserts that you make ;) after that pumpkin pull apart bread you're my go-to girl lol! I'll also jump on the bandwagon of ladies all for White Christmas!! My sis and I used to watch this movie growing up... even if it was the middle of July! Not gonna lie, we fought about who was which Haynes sister. And The Family Stone is a goodie too. It's a tear-jerker so have some tissues handy! Oh my gosh, ALL of those treats look amazing. I've never been a mint fan and all of the sudden I can't get enough. Just finished a little peppermint bark snack I grabbed at the register at Hallmark ;) Elf & The Holiday are my favorites, I haven't caught them yet but I will! The Home Alones are my favorite!!! I want to do all of the Christmas things! ALL OF THEM! I feel like I am so behind watching movies this Christmas. I have only seen Elf so far...and I have a long list of must sees every year! Yes to ALL the Christmas movies!! Love the card holder and the card book! Hope you have a great weekend with the inlaws! I love the idea to put the cards into a book to keep! It makes me sad that there are only three weeks until Christmas, I don't have time to do everything I want to! I am loving that monogram door hanger!! I am going to make one for my mom, she would love that!! You can bake me some goodies! Lol! :) I love watching Christmas Movies too! :) Especially Miracle on 34th Street and Home Alone. 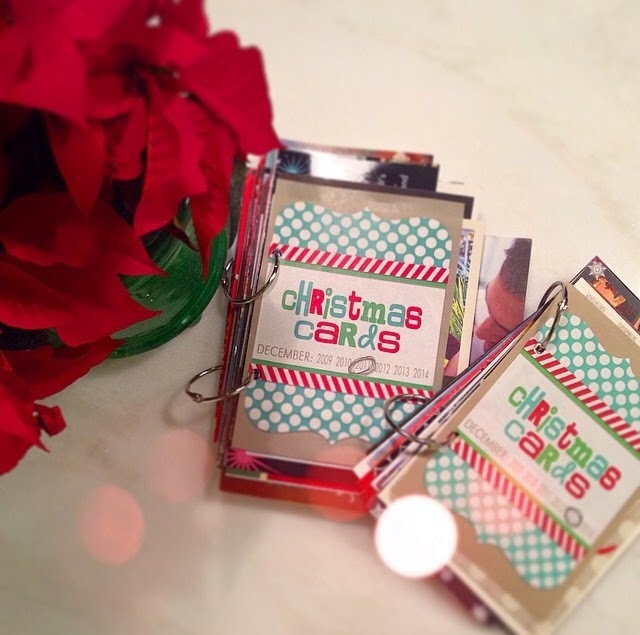 What a great idea with the Christmas card booK! I always keep my cards in a photobox but having that bound together year by year sounds like a fabulous idea!